FORT MYERS, Fla. (AP) -- Opening day at Yankee Stadium figures to be a lot different than the first meeting of the season between New York and the Boston Red Sox. FORT MYERS, Fla. (AP) — Opening day at Yankee Stadium figures to be a lot different than the first meeting of the season between New York and the Boston Red Sox. With Brett Gardner the only regular in the Yankees’ starting lineup, New York beat Boston 5-2 Sunday in the first of their two spring training matchups. Red Sox starter Ryan Dempster threw 25 of 28 pitches for strikes, allowing his only hit in three scoreless innings when Gardner reached on a single to shortstop starting the game. 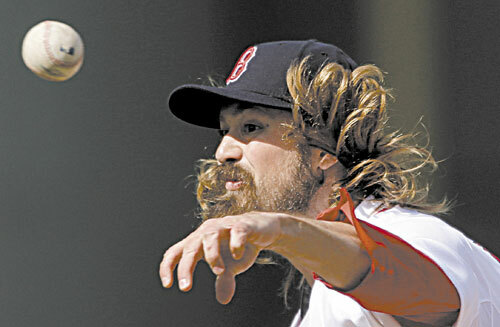 The rivalry is a new experience for Dempster, who signed a $26.5 million, two-year contract. Boston’s Mike Napoli, in just his second spring training game after being diagnosed with avascular necrosis during the offseason, homered off Adam Warren leading off the second. New York took a 3-1 lead in the sixth off new Boston closer Joel Hanrahan, who allowed Eduardo Nunez’s run-scoring single and Jayson Nix’s RBI grounder. Another run scored on a fielding error by third baseman Drew Sutton. Farrell also was impressed by Dempster. Winner Jose Ramirez allowed three hits in three scoreless innings. Warren gave up one run and three hits in three innings. With Curtis Granderson likely out until May while a broken left forearm heals, Girardi had Gardner in left and Melky Mesa in center. Girardi said the injury might cause him to keep Granderson in center when he returns rather than shift him to left and move the speedy Gardner to the middle. Notes: Red Sox 2B Dustin Pedroia said he would not object to stricter penalties for PED violations, as baseball Commissioner Bud Selig has proposed. “You want everybody to compete on the same playing field. That’s all I’m asking and everybody else is asking,” he said. … The Yankees reassigned RHPs Corey Black, Matt Daley, Nick Goody, Shane Greene, Bryan Mitchell, Zach Nuding, Mike O’Brien and Ryan Pope to their minor league camp along with INF Kyle Roller. … Gardner has hit safely in each of his six games this spring. … Jarrod Saltalamacchia returned to the Red Sox lineup for the first time since Wednesday after being sidelined by lower back stiffness and went 1 for 2. … Boston DH David Ortiz, slowed as he continues to rehab the Achilles injury that cut short his 2012 season, felt soreness in the injured area and out off more baserunning drills until Monday. Farrell said the next three days will be important in helping create a schedule for Ortiz to be ready for the opener. … Red Sox LF Jonny Gomes, out since sustaining a cut to his left knee Wednesday, is expected back in the lineup for Tuesday’s exhibition against Puerto Rico. … Red Sox RHP Daniel Bard, who has not been in a game since Feb. 25 while working on his mechanics, is expected to throw 20 pitches in a simulated game Monday.